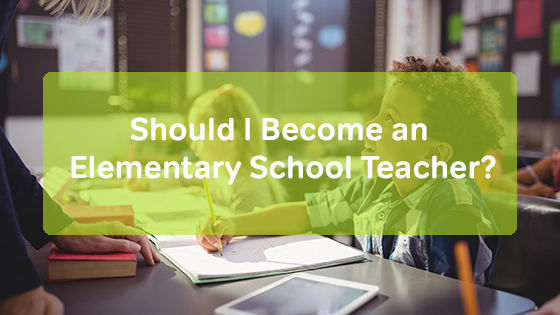 Should I Become an Elementary School Teacher? Every teacher has their own favorite age. Some teachers love teaching 4th graders, others enjoy the challenge of teaching high school calculus or teaching Kindergartners to read. Only you can know what age group is a good match for you. If you think becoming an elementary school teacher might be a good fit for you, here are some things to know. Elementary school calls for a lot of flexibility. Kindergarten is much different than 4th grade, but you’ll likely be certified for both (see “Certification” below for more). That means that, though it’s rare, you could be asked to teach a grade that’s pretty different than what you had in mind. Many teachers will teach a few different similar grades in the course of their career. For some teachers, this is a benefit. For others, it’s a deal breaker. Unlike a high school teacher that specializes in one subject, an elementary school teacher (with the exception of “specials,” like art or music) teaches all subjects. During the course of your week or day, you’ll cover reading, writing, math, social studies, science, and social emotional skills. This can be a great advantage for keeping yourself on your toes and helping your class to be well-rounded. On the other hand, it can be a tricky balancing act. In general, high school teachers make the most money and early childhood teachers make the least. According to the Bureau of Labor Statistics, the median annual income for elementary school teachers in 2017 was $56,900. There is, of course, a lot of variability in this amount based on your state and amount of experience you have. As a first year teacher, you likely won’t make this much, but you’ll earn more as time progresses. This is especially true if you choose to earn a Master’s degree in your field. While teachers generally don’t go into the field for the money, it’s worth considering if you can support yourself on the elementary school teacher salary you will be earning. There are more elementary school teachers in the U.S. than high school teachers or middle school teachers (source: Bureau of Labor Statistics). That means you have a bit better of a chance of being hired at a school as an elementary school teacher. That said, this shouldn’t be your main consideration. Given all the work it takes to get certified, it makes more sense to make sure you really love the grade level you’re pursuing. Most states require a Bachelor’s degree to teach elementary school. In addition, you need a state certification or licensure. There are two main certification options: Early Childhood Education or Elementary Education. If you know you want to teach younger elementary or Pre-K, an early childhood certification will allow you to teach children from birth through grade 2 in most states. Otherwise, an elementary school teaching certification will allow you to teach (in most states) kindergarten through at least grade 4. The certifications do overlap for Kindergarten through 2nd grade in most states. Think about what age group (younger or older than Kindergarten) you’d be mostly likely to want to teach when you are making your decision. Being an elementary school teacher can be so rewarding! Try it out during student teaching, get a good feel for your ideal age group. If developing a relationship with one class sounds especially good to you and you’d enjoy the challenge of teaching all the subjects, becoming an elementary school teacher might be a good match for you.